I've been reading the (so far excellent) book; "We said, they said: 50 things parents and teachers of students with autism want each other to know" by Cassie Zupke. A review is coming soon. 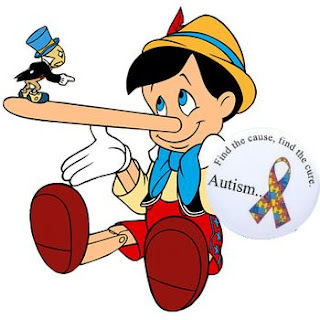 In the meantime, Chapter 5, entitled Hooey talks about the the confusing amount of contradictory and money-grabbing autism theory out there. I thought it was probably worth my while stating my motivation and my point of view. Hooey is not a word we use in Australia. I'm presuming it's an American word for bullsh1t. That's how we say it in Australia. We tell it like it is. My motivation on this blog has always been to raise public awareness of Asperger's syndrome and to provide a more balanced and positive place for parents and people with Asperger's syndrome to learn about themselves and their children. I don't claim to know everything but I do claim to have lived daily with Asperger's syndrome (if not the knowledge that I had it) for over 40 years. That's more than most doctors and childcare professionals can say. I don't have any hidden agenda and I'm not (at this stage anyway) planning to write a book or otherwise make money from the blog. You'll note that there is no advertising here - apart from book reviews which are honest and for which I receive no payment, apart from a review copy of the books. I just want to see some acceptance and to make the world a better place for those with autism. On the Cure for Autism. There's no cure. There's arguably only "spotty" detection too. If anyone says that they have a cure for autism, they're lying. In fact, personally, I don't believe that it will ever be cured - at least, not in my lifetime. I'm also not sure that a cure would be such a good idea. I do know however that some therapies can help children to better cope with their difficulties but there's nothing in the world that makes autism "go away". Even if a miracle cure were to be announced tomorrow, there would be many years of testing before it would allowed to be used on humans. In fact, it's a safe bet that if they found a cure, no child of that generation would benefit. As for me, I think the whole thing is both genetic and natural. I believe that autism has a place in our world, that it's one of those "curve balls" that natural evolution throws us from time to time. I think it's necessary for us to survive and grow because autism has, in some way, been associated with nearly every major breakthrough in human history. So even if there were a cure, I'd argue that it might spell the end of human creativity. The brain of Autistics vs NTs can be compared to that of Introverts vs Extroverts. We can't "cure" an extrovert by making them speak less. Similarly, Auties can be trained to act more like NT's, but there is no cure.
" So even if there were a cure, I'd argue that it might spell the end of human creativity." That's a very arrogant thing to say. It dismisses all the creativity of people who aren't autistic, whether they're "typical," have William's Syndrome, have Down Syndrome, or whichever else instead of autism. What an insightful quote from Ms. Grandin. As a young person, I was fascinated with Issac Newton and Albert Einstein and their ability to decipher the true nature of gravity when the reality is so far outside the evidence we are exposed to in our daily lives. I recently read that some people think that they were both Aspergers. I don't know if they were, but my first thought was that it would explain their "outside the box" thought process and that had not Einstein produced his work on spacetime, it may not have been discovered for another hundred years.